Have You Considered Renting Textbooks? Have you seen Study Dog? Blogorama Bonanza Back 2 School Event! Homeschool Giveaway's End of the Summer Event! Back to School with Famous Footwear BOGO! GoSum Math App for iPod or iPad Fun! FLVS Superstar Students ROCK at USTA Nationals! Back to School Bash Giveaway Hop! 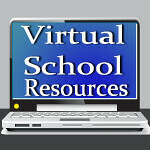 If you've visited Virtual School Resources before, you probably know I made the decision to homeschool my girls after several years of Christian private schools. It works for us. My oldest daughter will be 16 in September, and is in her second year of taking college classes. Depending on her major and choice of college, she could graduate from high school with her Associate's Degree. She was also just accepted into a prestigious internship at a marine aquarium where she has volunteered for the past year. Please don't take this as bragging! I want to share with you one of the tools I will be using when we apply for scholarships, so you can help your child get into the college of their choice, and apply for as much money as you can to help pay for it! I found Total Transcript Solution several years ago. 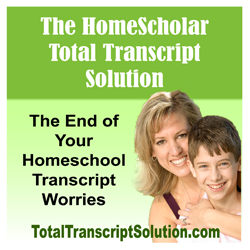 When you homeschool your children, you don't have the advantage of having a high school counselor prepare a transcript and help your child apply to colleges. That's Mom's job! Thankfully, Lee Binz has been there and done that, and designed a program to help us do it, too. from Their First Choice University! educators who insist they know better than you what’s right for your family! Total Transcript Solution has won awards every year, because it works. She has the endorsement of Andrew Pudewa of the Insititute for Excellence in Writing and Andrew Wile of Apologia Curriculum, two of the most amazing homeschool companies I have ever come across. Check out the testimonials of other families on the Total Transcript Solution website. If you are homeschooling your kids, or even if you aren't thrilled with the way your school is helping you with your child's educational success, I want to encourage you to check out Lee's site. You'll find tons of free articles and you can sign up for her emails. You don't have to do this alone! Let Lee help you!